For professional cyclists, going faster and winning are, of course, closely related. Yet surprisingly, for many, a desire to go faster is much more important than a desire to win. Someone who wants to go faster will work at the details and take small steps rather than focusing on winning. Winning just happens when you do everything right – it's the doing everything right that's hard. And that's what fascinates and obsesses Michael Hutchinson. 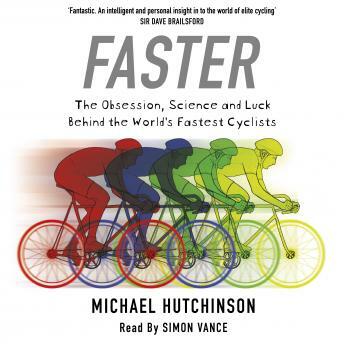 With his usual deadpan delivery and an awareness that it's all mildly preposterous, Hutchinson looks at the things that make you faster – training, nutrition, the right psychology – and explains how they work, and how what we know about them changes all the time. He looks at the things that make you slower, and why, and how attempts to avoid them can result in serious athletes gradually painting themselves into the most peculiar life-style corners. Faster is a book about why cyclists do what they do, about what the riders, their coaches and the boffins get up to behind the scenes, and about why the whole idea of going faster is such an appealing, universal instinct for all of us.